What's it like to have the gift of 'the cure'? On any given day, the phone calls start early and continue late into the night at Rebecca Hamilton's County Donegal home. From an initial hello, the caller quickly moves to ask is she "the woman who has the cure". The question finishes depending on their ailment. The cure might be for shingles, ringworm or mouth ulcers. Rebecca is quick to ask those who ring what medical help they are getting - if they say none, she tells them they should. Once she was asked by a farmer to cure a flock of sheep of the contagious ovine skin condition orf. "I never knew I had a cure for that," she told BBC News NI. "But he rang back three days later to say it had gone," she said. She's had the gift of the cure for more than 40 years, after being given it by an Irish man she met on holiday. Right across Ireland, there are people like Rebecca, said to be able to cure a host of common ailments. This is a land where local belief suggests water from certain wells or even soil from specific graveyards has healing properties. The cure - seemingly part folk tradition, part faith healing - predates Christianity. In a world of modern medicine, many people's belief in the cure persists. The secret prayers and set of actions involved have been passed discreetly from one healer to the next. In spite of the cure's pre-Christian origin, Rebecca's methods are based in prayer and a belief in God. At her home in St Johnston, her family joke that "she says more prayers than the Pope". How she came to have the cure is a "long story", she says. "We were on holiday in Austria, maybe about 40 years ago, and we fell in with an older couple. "She had fallen and broken her elbow and her husband Jack couldn't help her into toilets or things like that so I did. "We got talking, started to spend meal times with them and they told us Jack had the cure for shingles and ringworm. "My own husband Tom would often take people to a lady close to where we lived to get the cure. "It was something we had a belief in and knew all about. "Jack was in his 70s then and they had no family - I said to him that he would have to pass it on before his time came. "He came down to breakfast the next morning and said: 'Rebecca, I've been thinking over what you said and I want you to take it.'" Over the 40-plus years since, Rebecca has seen and spoken to thousands of people seeking the cure. In days gone by, she would visit people in their homes or they would come to her. For shingles, she circled the infected area with a pen knife. For ringworm, a lit candle was used in the same way. It was what Jack had instructed her to do. All the while, she recites two secret prayers passed to her by Jack - they have been kept secret to this day. The only thing she needs to know to administer the cure is the person's name. Working with a lit flame close to human skin scared Rebecca initially. "I was scared to burn someone but one day a man that lived close to us told my daughter about his wee girl who had ringworm and she said to bring her up. "I didn't want to use the candle but I did, I saw him a few days later and asked how she was - I asked if she had been taken to a doctor. "He said: 'There was no need Rebecca, sure didn't you cure her.'" In the years soon after Jack passed on his knowledge, Rebecca's fame grew so much she "didn't have the time to get around everyone". 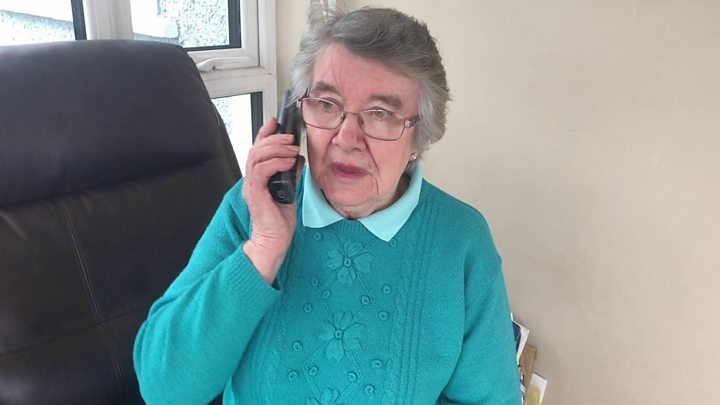 "Mostly I do it over the phone now, it seems to work just as well," she said. But Rebecca insists the cure belongs to God. "You say the prayers, mention the person's name and then it is with God." Back in 2012, David Allen from Londonderry had shingles. His mother knew Rebecca had the cure but he was sceptical. As the unbearable itch showed no signs of waning - and to appease his mother - he gave in. "Mum kept saying ring Rebecca, but I thought: 'What a load of rubbish,'" he says. "But to please my mum I gave in, I made the phone call to Rebecca. "Rebecca asked me a couple of questions and told me she would say the prayers - she said the shingles would go. "Within two days they were away." Sometimes people come back to Rebecca and tell her it has worked and say thank you but most times she hears nothing. She says nurses often get in touch asking for the cure and a nearby chemist often refers people to her. That local chemist was the person that first made her aware the gift might extend beyond shingles and ringworm. "I did not know I had a cure for cold sores until a girl called me and said the chemist had told her they come from the same virus as shingles - she was told to call me. "Now I get lots of calls from people about cold sores and mouth ulcers," she adds. Rebecca knows there are sceptics - it is up to others to decide how they view her gift. Those with the cure take no money for their endeavours. Often there is a comfort for people just to know they are being prayed for, says Rebecca. "I like to be able to help people, that's all I try and do."